David God’s Favoured King is one of the best known people in the Bible. The books of 1 Samuel, 2 Samuel, 1 Kings and 1 Chronicles describe the life of David, considered the most beloved leader in the history of Israel. Born in 1040 BC, David was the eighth, and youngest, son of Jesse of Bethlehem, from the tribe of Judah, and is a direct ancestor of Jesus Christ. When David God’s Favoured King was just a shepherd boy, he was summoned to play music for King Saul. Saul was so pleased by his music that he made him a court musician. 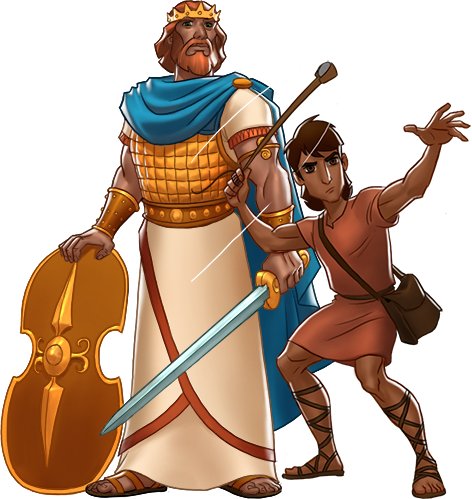 David gained even more popularity when he single-handedly killed the Philistine giant, an enemy soldier, Goliath, with just a slingshot and a few stones. David acknowledged that God helped him and was the reason for his victorious outcome. Saul then made David commander of his troops and Saul’s son, Jonathan, became his closest friend. Because of his success against the Philistine giant, women were dancing and singing “Saul has slain his thousands, and David God’s Favoured King his tens of thousands”. King Saul was filled with jealousy and tried to the kill David on numerous occasions. Despite Saul’s pursuit of David, David had no desire to kill King Saul, even though he had many opportunities. David was anointed by Samuel to be King Saul’s successor as king of Israel. Under David’s command, Israel united and won battles with their enemies. David brought “The Ark of the Covenant” to Jerusalem, the “City of David” in Jerusalem. But with overwhelming power and success, David’s focus turned to material gains. The darkest part of David’s life was when he committed adultery with Bathsheba, wife of Uriah who was a soldier in his army. David sent Bathsheba’s husband Uriah to the frontlines of the battle, so that he would be killed, to cover the consequence of his action. Bathsheba was pregnant. David truly repented of this and asked God’s forgiveness. David’s son Solomon succeeded him after his death. After forty years of leadership, David died at a good old age and was buried in the “City of David”. Despite his many faults, David was always a repentant man of God.